This past summer, when we were looking at the house we ended up buying, we discovered that the vinyl siding had been painted. I wasn't really thrilled with the vinyl siding on the house to begin with, but was even less thrilled that it was painted. I have no idea what the expected life of paint on vinyl siding is, and it seems that by painting the siding another layer of maintenance was added. One of the things that I learned a lot about from volunteering with Habitat for Humanity was how to hang vinyl siding. One of the many things you have to consider is that vinyl siding will expand and contract as the temperature increases and decreases. 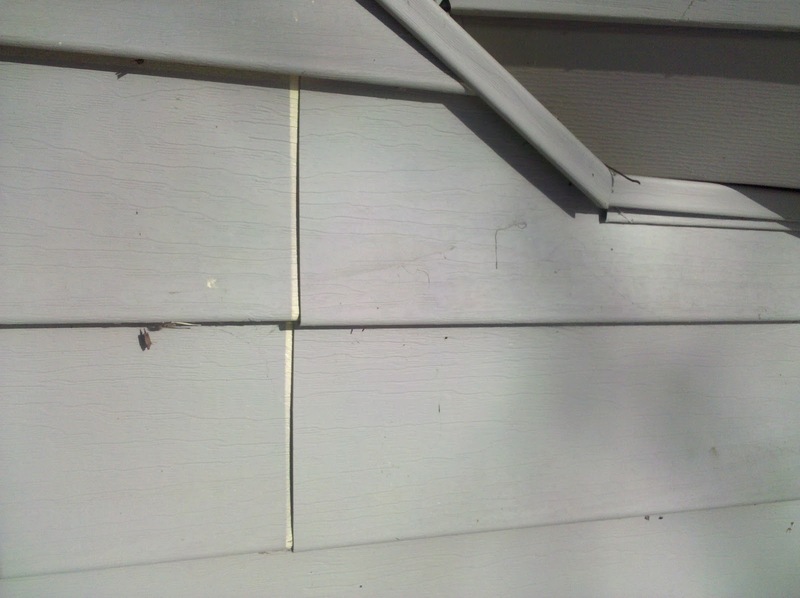 To properly install the siding so that it can expand and contract without buckling you don't nail the siding tight to the house. It has to be able to slide. You can see from the photo that the house was painted in warmer weather. The piece on the right is a full 12' length of siding. The piece on the left is a shorter piece which goes up to a corner. 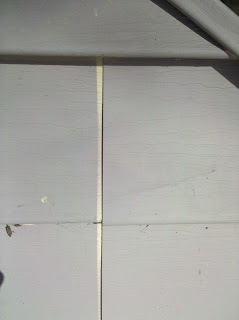 The right piece has contracted and exposed the original color of the siding. (The longer piece will expand/contract more). I suppose that the painted color is better than the original color, but I still wish it hadn't been painted. The take away message is that if you're going to paint vinyl siding, do it in the coolest weather possible, with the house in as much shade as possible. Or just don't paint it at all. I would love to use your pictures on my website. I have a few articles related to painting siding. I would like to use this as an example of what can happen. In fact, I have done just that, to show you, but will remove it if you respond and object. You can check out my site at http://www.house-design-coffee.com/paint-vinyl-siding . That article shows how to paint vinyl but I have a caveat at the bottom that points to another page where I address the problems and that has your picture, which points back to your site. Latest addition to the home! Lesson learned: get the furnace inspection!